Vitamin B12 is a complex and powerful little vitamin that may not come up on our radar screens very often. Some may think of B12 as the “energy” vitamin, but all B vitamins help to convert carbohydrates into glucose, the fuel that supplies energy to all bodily cells. B vitamins are necessary for the health of our skin, eyes, hair and liver and each has distinct roles to play in bodily functions. Specifically, vitamin B12 helps to maintain healthy nerve cells and assists in the production of DNA and RNA, our genetic material. B12 helps produce red blood cells, aids iron in producing oxygen-carrying hemoglobin and keeps homocysteine levels, a factor in cardiovascular disease, in check. 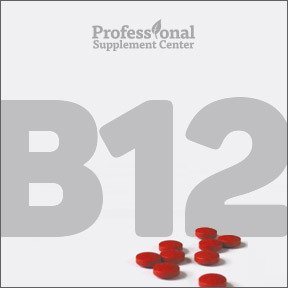 A healthy functioning body uses B12 efficiently, largely in the course of the recycling of B12 through the liver. Even though B12 is a water soluble vitamin, the liver is capable of storing minute amounts for several years. Yet, according to the National Institutes of Health, B12 deficiency is widespread. Initially, low levels of vitamin B12 may cause a range of symptoms including fatigue, shortness of breath, nervousness, digestive distress and numbness or tingling in the fingers and toes. Unlike other nutrient deficiencies that can be reversed with repletion, B12 is so vital to brain and nervous system health that a deficiency can cause permanent damage. Dietary B12 is found only in animal products, such as meat, dairy, eggs and seafood and in fortified foods, such as cereal products and tofu. Many of us may not consider how much vitamin B12 we actually obtain through our diets, so supplementation of this highly important nutrient may be the best way to ensure ideal levels for optimal health support. The stages of B12 deficiency may present very slowly, so it can go unnoticed for a long period of time. Those with pernicious anemia, an autoimmune disease that results in the failure to produce intrinsic factor, a substance required for B12 absorption that is normally secreted by the stomach. Left untreated, pernicious anemia may progress to megaloblastic anemia and irreversible neurological disorders, even when there is adequate dietary intake. Those who fail to produce intrinsic factor may require prescription injections of vitamin B12. Senior citizens are at higher risk of deficiency, as at around age 50 many people begin to lose the ability to absorb dietary B12. Vegans and strict vegetarians, whose diets don’t include any or insufficient amounts of animal products, are at high risk of deficiency and must be sure to supplement and include dietary foods fortified with B12. Vitamin B12 is bound to the protein in our food, and is released by the activity of hydrochloric acid and gastric protease, two factors that must be present in the stomach for B12 to be absorbed and utilized. Those who have insufficient production of hydrochloric acid may have very limited absorption of B12 and may require very high oral doses of vitamin B12. Those with Crohn’s or celiac disease, disorders that affect nutrient absorption, may not be able to absorb a sufficient amount of B12. Certain medications, such as those for diabetes and long term use of stomach acid reducers, increase the chances of developing a B12 deficiency. For normal function and optimal health, the body requires essential micronutrients, including at least 30 vitamins, minerals and other nutrient compounds. Working in harmony, synergistic nutrients support the bodily functions that not only keep us healthy but, more importantly, sustain life. A deficiency in one vitamin may affect the functioning of others, meaning that multiple deficiencies may be present simultaneously. Vitamin insufficiency is linked to the development of chronic diseases, including diabetes, osteoporosis, heart disease, dementia and night blindness to name just a few. B12 deficiency is a serious health issue that should not be taken lightly. For those at high risk of deficiency, supplementation with vitamin B12 is considered a safe and effective way to support neurological health, energy production, red blood cell formation, nervous system function and DNA synthesis. A multivitamin and mineral formula that includes the full complement of B vitamins or a B-complex formula that contains the complete range of synergistic B vitamins may be the ideal solution to ensure adequate intake for those at a lower risk of deficiency. Vitamin B12 by Designs for Health – Each natural berry flavored lozenge delivers 5,000 mcg of activated B12. Formulated to be dissolved in the mouth in order to deliver B12 through the mucous membranes and bypassing the intestines for those with absorption issues. Gluten free, Non-GMO vegetarian formula. Vitamin B12 2500 mcg by Douglas Laboratories – These sublingual tablets, designed to improve absorption and bioavailability, dissolve rapidly to deliver 2500 mcg of pure vitamin B12 for those who wish to increase their B12 intake. Convenient dosing with one daily tablet. B12 5000 Liquid by Pure Encapsulations – This popular formula provides 5,000 mcg of vitamin B12 in a convenient and bioavailable liquid form. Naturally flavored with apple and black currant juice. Gluten and soy free, Non-GMO vegetarian formulation. Vegan Vitamin B12 Sublingual – These pleasant tasting, quick dissolving sublingual tablets supply 1000 mcg of vitamin B12, plus vitamin B6 and folate. This highly bioavailable vegan formulation helps to ensure adequate intake of this essential and very important nutrient. Gluten, soy and dairy free. This entry was posted in Home and tagged B12, B12 5000 Liquid by Pure Encapsulations, Vegan Vitamin B12 Sublingual, Vitamin B12, Vitamin B12 2500 mcg by Douglas Laboratories, Vitamin B12 by Designs for Health. Bookmark the permalink.